Last year the dynamic Italian Glomex Company, specialized in manufacturing antennas and TV SAT systems, introduced an innovative product available now in its definitive version, although it can be always updated due to its structure. 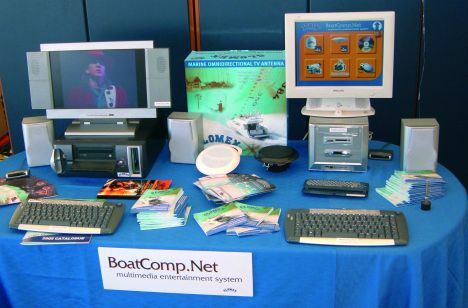 Talk is of BoatComp.net, an integrated system for entertaining and communication: in detail it's about an apparatus featuring the following functions: TV with digital and SAT decoder, Terrestrial and SAT radio systems, DVD, CD, MP3 player as well as various video and audio compression formats, a platform for surfing in Internet, sending and receiving e - mails, writing or visualizing all documents received, surfing in the great network by either GRPS with GSM or by other connecting forms; moreover Boat.Comp.net also features a platform made for managing video - games, representing via graphics all boat and equipments manuals in effort on visualizing and fast searching any interesting argument. Such an integrated multisystem could appear difficult to use indeed, but this is not BoatComp's case being it user - friendly equipment thanks to its high - quality software capable to fast and directly lead via graphics the one who uses it towards the best choice. The system consists of a central unit and peripheral ones installable overall on board; they are all independent from each other and capable of offering each guest the performance or service he want to use, also simultaneously. For operating all this is sufficient to use a remote control properly made for, manufactured from the company in Ravenna comprising also a complete QWERTY key board for writing via mail, etc. Advantages immediately coming from this apparatus on board a yacht result in its input system and lead in since the input signal will be then equalized from the central unit to the peripheral ones. Practically by all necessary for connecting only an apparatus enclosing BoatComp.net before, it is possible to operate simultaneously a virtual all - comprising rack now. Its powerful hard disk allows saving films, music, documents, archives, games and all it is needed to be on board while cruising. Concerning the audio output Boat Comp is a Hi Fi system being provided by high - quality components capable to ensure high audio level. In size it is compact and its box, right studied to allow it suiting to any surrounding, makes it aesthetically pleasant.